Things To Do In Vancouver During April - For Cheap! 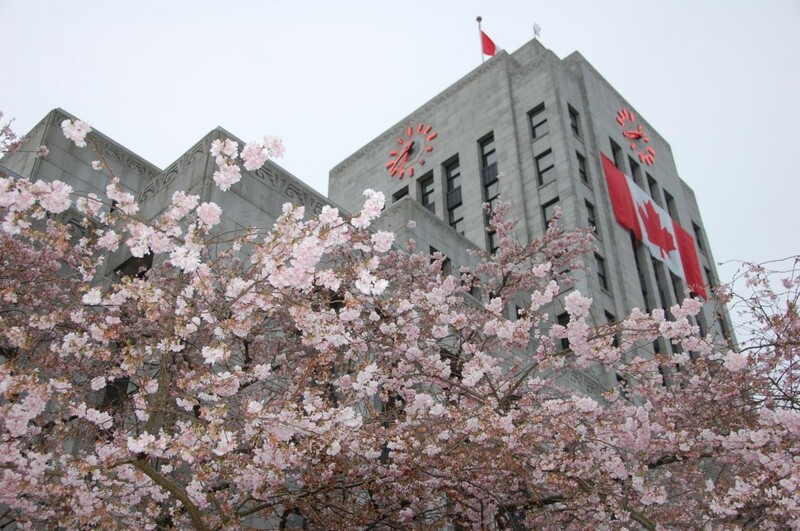 We are excited that spring is officially upon us and Vancouver is starting to look even better each day! It's time to venture outside and go exploring around the city. Here is our offering of fun and cheap events happening in Vancouver during April. April 2 & 3 - Sakura Days Japan Festival at VanDusen Garden! There are a lot of great things to come out of Japan: Sushi. Hello Kitty. Ninjas. Cherry blossoms. Karaoke. Most technology. Pocky. Robots. Celebrate some of the more culturally traditional wonders of Japan at the Sakura Days Japan Festival. Enjoy taiko drumming, martial arts, dance, participate in a tea ceremony, learn about origami, write haiku's, and try on an authentic yukata. No guarantee of robots or ninjas though. Admission is $8 for adults, $6.50 for youth and $5 for children. For more info and a full event schedule, click here. April 14-16 When I Was A Kid (Shane Koyczan performance) at The Clutch! Ever miss the days of being a kid and feeling invincible? Shane Koyczan, now well-known for his Olympics opening ceremony performance, explores the finer points of growing up in this poignant performance. A mix of multimedia and spoken work, Shane will take the audience on a journey to rediscover our silliness and embrace our wonder. Ticket price ranges from $14-40 and can be purchased in advance here. April 16- Hoopfest at Cambie Secondary School! BC Wheelchair Basketball is hosting it's 18th annual Hoopfest fundraising event. Ever wanted to try out wheelchair basketball, or watch others play? Well, April 16th is your lucky day! Event is free to attend as a spectator, and you have until March 30th to register a team to participate. The day also includes demonstrations and a silent auction. More details and registration information here. April 17- Vancouver Sun Run! The big event for novice and seasoned runners alike certainly is the 27th annual Vancouver Sun Run, Canada's biggest running community event. The 10k event leads participants along the beautiful downtown sea wall, across the Burrard Street bridge and back downtown over the Cambie Street bridge. Race starts at 9am at Georgia and Thurlow Street. If you're a runner, it's not too late to register. If you'd rather watch, there are many great locations to watch thousands of people zoom by you. One sure sign that summer is around the corner is the reopening of Playland for the season. 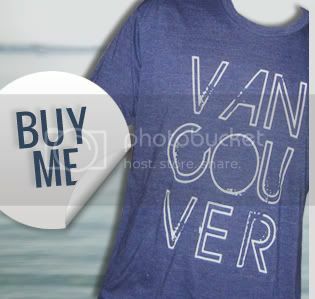 Anyone that has grown up in Vancouver will have many fond memories of long summer nights riding rollercoasters, eating cotton candy, and playing carnival games there each year. You also know the significance of boasting that you've ridden "the coaster" because you actually know what "the coaster" is. 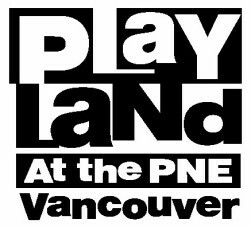 It's no Disneyland, but Playland is a must have adventure for anyone in Vancouver during the summer. Admission pricing and park hour information can be found here. If you have an event happening in Vancouver that you think we should let people know about, please send us a note here so we can include it! 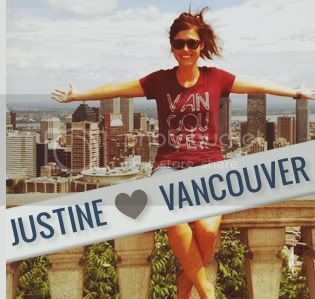 And as always, make sure to send in your picture of you wearing your Vancouver, we love you shirt at any events you attend. 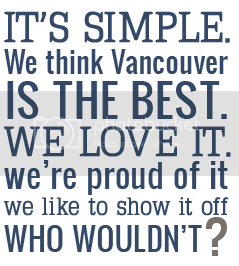 We love hearing from you almost as much as we love Vancouver.